I’ll post this up since it’s basically a jean, technically duck canvas. Ignore that they aren’t hemmed yet, just got them. I like everything about this but feel that the balmorals are a little too sleek. I think the Miyagi's you just picked up could be a better alternative? It's interesting. I have been testing out those Grant Stone bals for a few wears now and every time I post about them people mention how they aren't sleek enough for them haha. I like them but generally don't wear many bals, bluchers certainly work better for my wardrobe. X-post from CM. Darker jeans would have worked better imo, and possibly a leather shoe/boot rather than suede. Thoughts on the knit polo? Y/N? I like it personally and the green tweed jacket is so, so good. I know this one is MTM/Bespoke but do you mind if I ask what size you normally take @DavidLane ? 46/48? Looks fine, but have the sleeves shortened a tad. 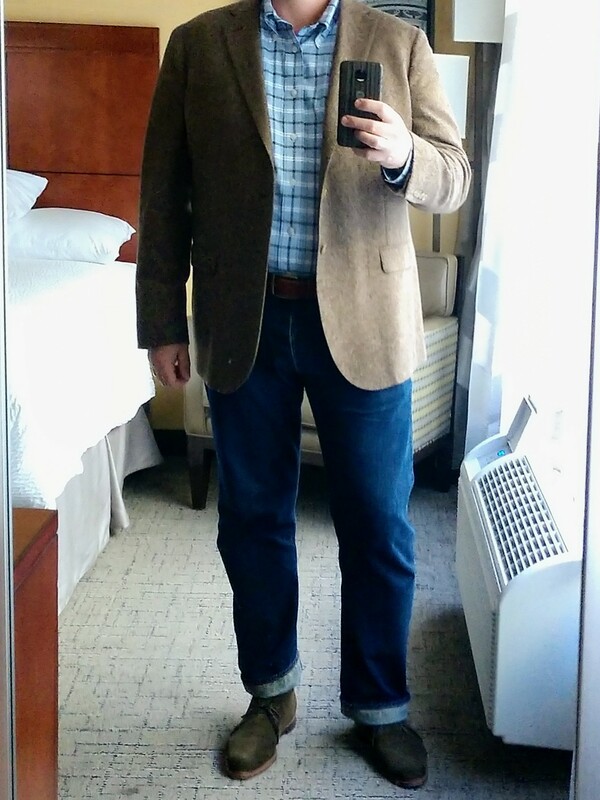 X-post from CM, denim today with blues and suede. May have worked better without the pocket square. This thread is like Groundhog Day. The movie, not the holiday or the musical. I love this look, it's so me. I'm a gray color worker and my social circle it's very casual, so I'm looking for out fits that can be dressy but still causal. The SC,long sleeve polo, jeans and suede shoes it's the perfect balance. I used to do chinos, SC, leather shoes and long sleeve but I was feeling too formal. I love sport coats it's by far my favorite jacket when weather it's chilly.